Better late than never, right? While I shake off the rust and let the rest of the psilocybin run through my system, it's probably best to slowly get back into the grind of covering the WSOP. I definitely feel guilty for my fellow media reps who got stuck in the WSOP prison while I got a furlough, but then again, I fortunate to be my own boss and call the shots. In order for me to write the best I possibly can before the Main Event and 50K final table, I needed this short reprieve, but at the same time, my next book will be about being on the road with Phish, so this past weekend was necessary research. Episode 1: Woe Is Benjo (3:59) - Pauly, Dan, and Benjo returned for their first episode of the 2011 WSOP. Dan and Pauly are upbeat about the upcoming summer, meanwhile Benjo reveals he's not looking forward to the suicidal tendencies which crop up three weeks into the WSOP. Dan and Benjo also discuss a potential prop bet about whether or not Howard Lederer makes an appearance at the 2011 WSOP. Episode 2: Ivey Drops Drama Bomb by Suing Full Tilt and Boycotting the WSOP (6:07) - Change100 joins Benjo and Pauly as they discuss the strange happenings on Day 1 of the WSOP. Phil Ivey became the only thing people discussed the Rio after a rather bizarre series of posts appeared on his Facebook page after he revealed his lawsuit against Full Tilt due to their lack of action getting money back to their players. Also, Benjo explains the scene when James Bord harassed and threatened John Juanda. 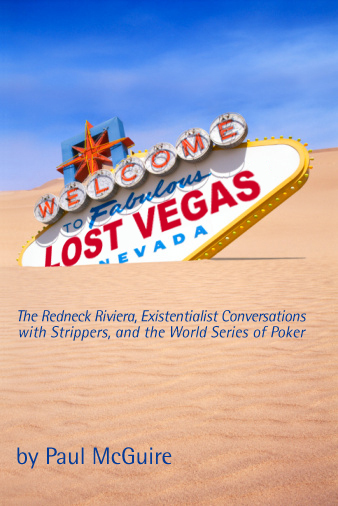 Episode 3: Dan's Smoothie and Welcome to the Mothership (3:06) - Dan finally showed up to the WSOP a little late... three days late... and he ran into a credentials snafu. Pauly gives him some guff while he covers the heads-up Grudge Matches, but Dan is digging the plush couches behind the media perch. Episode 4: Team Pokerati Update and the Men the Master/Hollywood Dave's Fracas (4:58) - Dan and Pauly hang out on the rail of Event #3 $1,500 Omaha 8 after the money bubble bursts. They discuss updates on Angry Julie, a member of Team Pokerati, along with detailing the highlights of argument that almost turned into a brawl when Men the Master (ironically) accussed Hollywood Dave of being a cheater. Episode 5: Norman Invasion - Dan and Pauly try to hang out at the final table of the $25,000 Heads-Up Championship between Jake Cody and Yevgeniy "JovialGent" Timoshenko. However, they got stuck around a gaggle of drunken Brits supporting Jake Cody and then find themselves getting in the way of ESPN's camera crew while they taped a stand-up for Lon McEachern and Norman Chad. Episode 6: Ivey's Lawyer (4:17) - Dan and Pauly chat about the Ivey drama that transformed the opening days of the WSOP into the "World Series of Phil Ivey." Dan also shares some inside info on Ivey's lawyer, renown criminal attorney David Chesnoff. Episode 7: Sahara Liquidation with Remko (6:12) - Benjo and Pauly discussed the Sahara Casino liquidation sale/auction with one of the members of the Dutch press, Remko. Both Remko and Benjo expressed a keen interest in acquiring a slot machine for super cheap, while Pauly has his eyes set on a Pai Gow table. Meanwhile, Benjo and Remko try to figure out how to ship a slot machine from Vegas to France and Holland. Episode 8: Eskimo Yes, Jesus No (4:22) - Dan and Pauly try to pinpoint which pros are noticeably absent (Clonie, Jesus, Howard Lederer), while Eskimo Clark sightings have been rampant. They also try to figure out where the old Bat Beat Bar and Lounge went and why its been replace by a oxygen bar. Episode 9: False Flags and Low Lights (4:04) - Dan and Pauly wander around the Pavilion and Dan points out the flags, or lack of international flags, hanging from the rafters. While Dan spins an international false flag conspiracy, he also wonders about the lack of bright lighting at this year's WSOP. Episode 10: Hellmuth Denied with Change100 (2:46) - Seconds after John Juanda defeated Phil Hellmuth (who was seeking his 12th career bracelet), special guest Change100 and Pauly chat about the three hour heads-up battle between Hellmuth and Juanda. Episode 11: Bookies, Dumpsters, and Mavericks (5:16) - Dan and Pauly ditch the action at the WSOP and wander over to the sportsbook to watch Game 6 of the NBA Finals, because Pauly bet the Mavs, which is also Dan's hometown team. Dan asks Pauly to describe some of the complexities of sportsbetting, both in Vegas and in the shady underworld of online bookies. Episode 12: The Tweaker Edition (4:02) - Benjo and Pauly hang out at the Gold Coast and watched a tweaker get 86d by security. They later encounter the tweaker in the parking lot, and Benjo asks Pauly for a quick tutorial about the seedy Las Vegas meth scene. Episode 13: Black-Hat Bracelet with Change100 (3:59) - Dan shows up at the very end of a big poker event, and observes with Change100 the first major on-the-felt story of the WSOP. They didn’t know as they discussed the color of hats and misprinted souvenir T-shirts going to Haitian refugees that they were witnessing the only other true all-in-and-a-call situation prior to the end of a heads-up match-up between two different kinds of bad-boys several hours later. Episode 14: Old School Cheats with Johnny Hughes (6:02) - Pauly sat down and chatted with a special guest -- the legendary Johnny Hughes -- who has been in poker circles for 50+ years. Pauly asks Johnny to share some stories about old school poker cheats and the "fear" of getting caught, which kept a lot of shady characters in line. Episode 15: Brickless Cash Games (4:43) - Dan and Pauly hang out on the rail of the high-stakes cash games in the Rio. They describe the bustling scene, but are a little disappointed the massive PLO cash game isn't running. Episode 16: Brickless Cash Games Reprise (3:22) - Dan and Pauly recorded a quick follow-up to their previous episode while they hang out on the rail of the high-stakes cash games. They spot Eskimo Clark, "Cowboy", and other broke dicks lingering around seeking handouts from the high rollers. Episode 17: WSOP Fashion Report with KevMath (5:10) - Pauly chats with KevMath, who is a self-described "fashion expert." The two compare and contrast the different styles of clothing worn by members of the media. KevMath also reveals why he won't wear shorts. Episode 18: Mothership Stench with Timtern (2:43) - Pauly and Timtern are in the press section inside the Mothership, while sweating the final table of the Donkament. Timtern shares a story about a couple of railbirds who put him on mega-tilt, including the guy who took off his shoes. Pauly also describes the sketchy, yet pungent scene inside the Mothership. Episode 19: KevMath Keno System with KevMath (6:01) - Pauly and KevMath hang out at the dive bar in a bowling alley at the Gold Coast. KevMath was in the middle of crushing a video Keno game, when Pauly asked him to share a couple of his big secrets to beating the game. Episode 20: Adieu, Benjo (8:40) - After almost a week of speculation and rumors, Benjo confirms that he's leaving Las Vegas and heading home to France. His brief stint at the WSOP is officially over. One chapter ends, and a new one begins. Dr. Pauly, Dan and Benjo hang out in the dive bar inside the bowling alley at Gold Coast to listen to Benjo bid his farewells. Episode 21: New Dynamic Duo with Snoopy (5:59) - Pauly holds auditions for a new sidekick with only one requirement -- a outrageous accent. Snoopy, a writer from London, nails the audition. In this episode, they discuss modeling their new dynamic duo on the Batman & Robin television series, in addition to re-locating the Bat Cave to England and installing bat poles in the press box. Episode 22: Eskimo Dementia with Joe Dub (3:33) - Pauly bumps into Joe Dub while covering the final table of the $2,500 Razz. Joe Dub is eager to tell the story about how he saw Eskimo lurking around the rail of the Razz event and unsuccessfully trying to bum a stake off of someone with dementia. Joe Dub also shares a personal story about Eskimo asking him for money the first time they ever met. Episode 23: Brazil's Mothership Invasion with AlCantHang (2:50) - Pauly and AlCantHang are on the rail inside the Mothership watching the heads-up battle between American Nachman "The Landlord" Berlin and Brazil's native son Andre Akkari. Al and Pauly record a quick episode moments after Akkari won a decisive pot to cripple Berlin, and the Brazilians went berserk. That's it for now. I'm back in Vegas and will be providing coverage from now through the November Nine is set. Thanks for being patient and allowing me to get my head on straight before the Main Event Madness. Your fashion report with Kevmath is still my favorite of the summer.